Make it extra special with a delivery of fresh long stem roses. 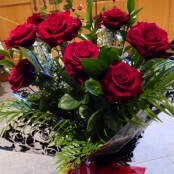 All our rose bouquets and handties include the very best long stem roses that are sure to impress. Your recipient will delighted and feel truly loved.